The National Museum of Indonesia is located near Merdeka square. It is the best of its kind in Indonesia and one of the finest in Southest Asia. 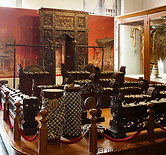 The museum hosts a large number of Indonesian artifacts from all historical periods, including a large number of sculptures and stone artifacts from the Hindu and Buddhist periods and objects of the various ethnic groups in Indonesia. The museum was initially set up in 1862 by the Royal Batavian Society of Arts and Sciences. On the first floor of the museum there are treasure rooms with items made of gold and other precious materials.